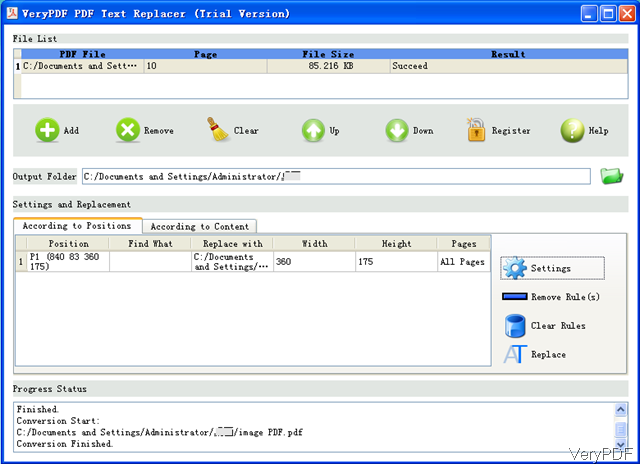 ← How to replace text in password protected PDF file by command line? In some company PDF documentation files, we may add company logo for distribution or long time preservation. However, once company logo updated, it will be troublesome to update logos one by one. Here VeryPDF will show you one method of updating logo in PDF in batch even if there are thousands of PDF files in one go. 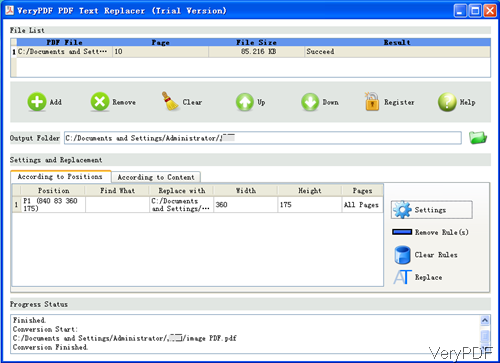 I use tool named VeryPDF PDF Text Replacer GUI version. If you need to know more about it, please visit its homepage. 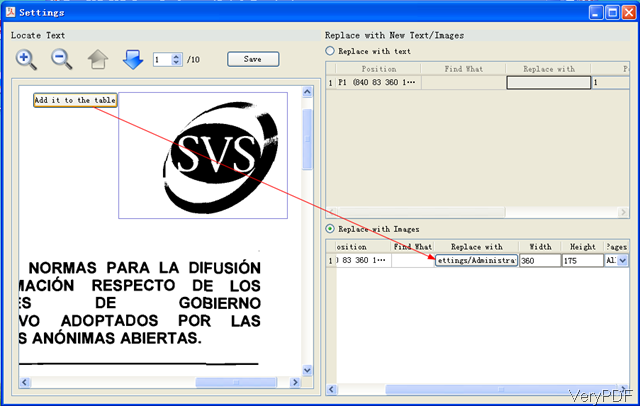 In the following part, I will show you how to update logo in PDF by this software. When installation finishes, there will be an icon on the desktop. Simply click the icon then you can launch this software. The following snapshot is from the software interface. When you open software interface, please add PDF files to software interface. You can add PDF by dragging from its containing folder to software interface or clicking button Add. Once you add PDF to software interface, they will be shown on software interface. Please go to According to Position tab and the clicking button Setting, then you will see the following snapshot. Please left-click the mouse then draw an area around the logo like I showed in the above snapshot, then there will be button named add it to the table, please click it. And go the the second part, Replace With Image. In the replace part, please click button Browse to add the latest logo icon here. In the width and height part, you can specify the latest logo width and height. In the pages part, you can choose the replaced page range. If you need to apply it to all, please choose All. Then click button Save to save it as a rule. Meanwhile you will back to the main interface. In the software interface, please click button Replace then the process will be launched. Once the conversion finishes, at the bottom of the software interface, there will be report. Now let us check the replacing effect from the following snapshot. During the using, if you have any question, please contact us as soon as possible. This entry was posted in VeryPDF Blog and tagged update logo. Bookmark the permalink.